Headaches can be severe enough to cause a significant impact on the, employer, and the health system. When considering the cost of lost work and productivity there is an estimated price tag of $13-17 billion annually (Souza 2009). More importantly however, is the impact that it has on an individual’s life. A recent study indicated that impact on patients’ quality of life could be greater than that of individuals who suffer from such conditions as Chronic Osteoarthritis, Hypertension or Diabetes. Prevalence (the amount of sufferers) depends on the type of headache you have. 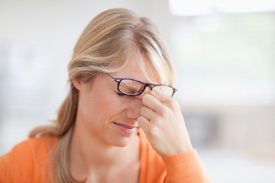 It has been reported that the incidence may be as high as 38% in the adult population for certain types of headaches. Of these headache suffers, only about 4% of patients have the need to attend in-office (medical) or in an emergency room setting indicating serious pathology. Of the patients that suffer from ‘non-serious pathology’ conditions, Chiropractic care was the most sought out alternative therapy (Souza 2009). There are several categories of headaches, which distinguish among the primary type of headaches. The International Headache Society (IHS) sets these categories. Your Chiropractor, when talking your medical history and physical examination will use these categories as guidelines to diagnose the type of headache you have. This will guide the Chiropractor in determining if your headache is due to a primary cause or if a serious pathology may be indicated. Medical referral is rare, however your Chiropractor will screen for secondary causes and if further investigation is required, will provide the adequate referral. Your Chiropractor will determine the type of headache you have; that been, Migraine, Tension-type, cluster, or Cervicogenic. In addition they will check if there are any obvious triggers or patterns to the headache, and evaluate the other musculoskeletal factors that may influence or trigger your headaches. If Chiropractic treatment and modalities can help with your case, your Chiropractor will discuss your condition with you, and offer a tailored treatment plan. The latest scientific evidence recommends the below treatment protocol for Migraine, Tension-type headaches and Cervicogenic headaches. Spinal Manipulation (adjustments) for the management in patients with migraine (episodic or chronic) with or without aura, as well as episodic Tension-type headaches. A trial of twice a week, for the duration of 3-8 weeks will be recommended by your Chiropractor depending on your specific case. Massage therapy for reducing the frequency and for improving symptoms that are linked to headache pain may also be helpful. A weekly session in conjunctions with spinal manipulation (adjustments) is recommended. The specific prescription of exercises (aerobic exercise, neck exercises, or whole body stretching) combined with spinal manipulation and massage therapy may also be recommended. Your Chiropractor will be able to provide you with the right advise and tailor your treatment plan to your specific case. It may also be probable that physical related stress is a contributing to your headaches, and factors that contribute to your stress in combination with these treatment modalities may be useful in your recovery to health. Another factor to take into consideration is the Temporomandibular joint (TMJ). The TMJ is closely related and have overlaying clinical indicators related to tension-type headaches, either through muscles in the area, clinking of the TMJ, and abnormal mandibular patterns on opening and closing. It is reported that 65% of patients with TMJ dysfunction have frequent headaches. Your Chiropractor will assess your TMJ as part of the physical examination and ascertain if TMJ dysfunction is associated with your headaches. At Wholistic Health Centre, we understand headaches and our highly skilled Chiropractor can assess and offer personalised treatments are aimed at improving your headache, and reducing any functional impairment based on the above scientific evidence. We have a wide range of treatment techniques such as spinal Manipulation, acupuncture, low-load Mobilisations, posture improvement advice, muscle lengthening or massage, trigger point therapy, relaxation exercises, and take home activities. Better health is a phone call away. To find out if chiropractic may be able to correct the cause of your headaches, contact us today on (02) 9599-6554. Bryans R, Descarreauz M, Duranleau M, Marcoux H, Potter B, Ruegg R, Shaw L, Watkin R, White E. “Evidence-based guidelines for the Chirorpractic treatement of adults with headaches.” Manipulative Physiol Ther. , 2011: Jun; 34(5):274-89. Peter J. Tuchin, Henry Pollard, Rod Bonello. “A Randomized Controlled Trial of Chiropractic Spinal Manippulative Therapy for Migraine.” Journal of Manipulative and Physiological Therapeudics , 2000: Volume 23, number 2, pg.91-95. Souza, Thomas A. Differential Giagnosis and Management for the Chirorpactor . Burlington MA 01803: Library of Congress Cataloging , 2009.